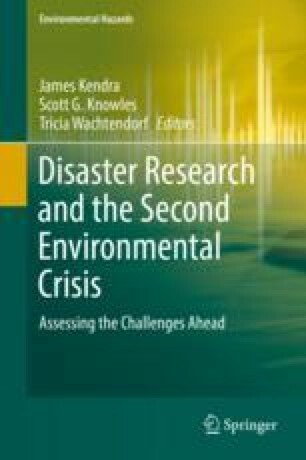 This work calls for the development of the field of disaster science. Specifically, it calls on those in the disaster research community to develop a grand vision for the field. This vision could include assembling the various disciplines that study disasters; examining large scale community and society disruption, dissembling, and destruction; and concerning itself with the social, technical, and environmental phenomenon that pertain to the causes and recognition of, as well as the reaction and adjustment to, various stages of that process. Incremental aspects of this effort already represent much of the actual work of interdisciplinary disaster researchers. The author provides an argument for why a rethinking of the field is important. Quarantelli, E. L. (2006). Catastrophes are different from disasters: Implications for crisis planning and managing drawn from Katrina. Understanding Katrina: Perspectives from the Social Sciences, Social Science Research Council. Available at: http://understandingkatrina.ssrc.org/Quarantelli/. Accessed 5 Jan 2009.